The gold price jumped more than $30 on Tuesday to touch a high of $1,620 as Ben Bernanke sang the praises of the US Federal Reserve's QE program. In early afternoon trade on Tuesday gold for April delivery was changing hands for $1,612, up $26 on the day. After a brutal week that saw the metal drop to a 7-month low of $1,555, gold has recovered much of the lost ground over the last two days. Before the rally this week, it looked like one way traffic for gold: ETF investors sold 66 tonnes of gold – the biggest weekly redemption on record – last week. Gold investors have been worried that the Fed's quantitative easing program would be coming to an end sooner than thought, but Bernanke's remarks have soothed those fears. The Fed's balance sheet crossed the $3 trillion mark early into 2013 through the buying of Treasurys and mortgage bonds to the tune of $85 billion a month. If the central bank's program remains in place unchanged, the Fed's assets buying bill will top $4 trillion before the end of the year. 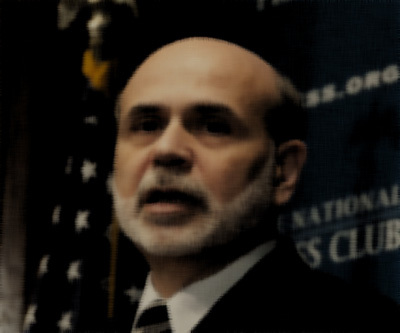 The first QE program was announced by chairman Ben Bernanke in December 2008 when an ounce of gold cost $837.50.